Having two girls ourselves means that we are more than aware of the needs and wants of families when you go on holiday. If the children are happy – then the parents are as well. The basic principle behind our holidays is that you shouldn’t have to pay huge prices just because you have children, and particularly if you go during “peak” season during half term and school holidays. We offer free child places all year. Both for winter skiing and also in the summer. We provide simple, chalet-style, family accommodation. Typically that would mean a suite with a double bed and another room with bunk beds for the children with en-suite bathroom and plenty of hot water to go around! The chalet is “child-friendly”, made safe for the young ones and has a range of equipment to entertain them; from DVD’s to toys, to sledges and books, to games and art supplies – all geared to ensure that the parents have a relaxing a time as possible! The most important part of the holiday is that all children under the age of 16 at the time of travel, stay free of charge! Kids will ove the chalet! Whether it be a summer family holiday or if you are skiing with children, childcare is perhaps one of the most important things. 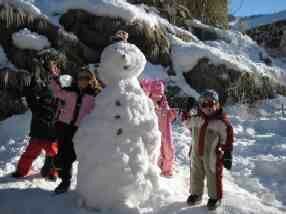 Building snowmen – part of the in-house childcare! We offer in-house childcare which means your children are cared for in an environment which is both safe and familiar, and therefore you are free to relax knowing your children are happy.